Newcastle United will hold a full inquest following the club's relegation from the Premier League, managing director Lee Charnley has promised. The Magpies dropped to the Championship for the second time in seven years after Sunderland beat Everton 3-0. "The process of scrutinising what went wrong and planning for what is to come has already begun," wrote Charnley. Norwich City were also demoted, while Aston Villa's relegation was confirmed weeks ago. Charnley added: "We are devastated at our relegation from the Premier League, as I know every single person connected to this football club will be. "We know that supporters want to know what the future holds and will want to hear more from us as soon as possible." The Magpies narrowly avoided relegation last season but could not avoid the drop this time, despite the appointment of Rafael Benitez following the sacking of Steve McClaren in March. They also spent £12m on Andros Townsend and the same sum on Jonjo Shelvey in the January transfer window. Benitez's future is uncertain. 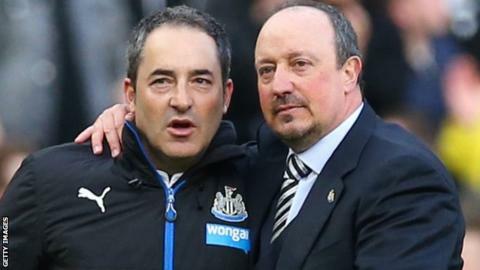 The former Liverpool, Inter Milan, Chelsea and Real Madrid boss signed a three-year contract, but this is understood to contain a break clause in the event Newcastle were relegated. "I want to thank all of the fans for the support you have shown for the club you love throughout the season, in spite of this massive disappointment and under-achievement," added Charnley. "Your support throughout has been magnificent, but I want to pay particular thanks for the incredible backing you have given to Rafa and the team during the latter part of the season. "Nothing more could be asked of you and I am truly sorry we have not given you the outcome you deserve." Norwich ended their home campaign with a 4-2 victory over Watford but it was not enough to extend their stay in the top flight to a second season. "It is a severe disappointment," said Norwich manager Alex Neil. "We had it in our hands five matches ago, but we came up short." The Scot, appointed in January 2015, paid tribute to the club's fans and took responsibility for the club's predicament. "We have not given them too much to shout about and that makes it harder for me to accept letting them down," he added. Home fans sang in support of Neil in the second half and during a lap of appreciation following the final home game of the season. "That, for me, was really, really humbling," said Neil. "For them to respond in that way, I didn't expect. I think it's really unusual. I can only thank them for that." Neil said he would sit down with owners Delia Smith and Michael Wynn Jones to discuss what happens now. "There's a lot of soul searching and discussions to be had to decide which way the club is going to move forwards," he said. "My future doesn't really concern me at this moment in time." Sunderland manager Sam Allardyce admitted he had doubts about the club's chances of survival following a 6-2 loss at Goodison Park in November and then a run of five defeats at the end of 2015. "It is outstanding from the grim dark days of December, when we lost five games on the trot," said Allardyce. "It's been a test not just on the field but off it. "I've always tried to focus on the players and not let the outside influences affect me, particularly through the hard times, and I think in the end we've come through it stronger and stronger." Allardyce says recruitment is key if the club are to avoid another battle against relegation next season. Wahbi Khazri, Jan Kirchhoff and Lamine Kone were brought in by the 61-year-old in January and played a key role in Sunderland's resurgence. The Black Cats have lost just one of their past 10 games. "Trying to get off to a flying start next season would be the main aim." Allardyce also praised the contribution of 33-year-old striker Jermain Defoe and said the club could not have stayed up without his 15 Premier League goals. "Jermain ended up winning us games and in the end that has got us safe," said the former Newcastle and West Ham boss, who was appointed in October.